A warm & convenient breakfast to start the day off right. Add some fun to your family's breakfast routine! 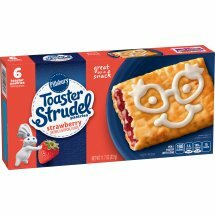 Pillsbury Toaster Strudel™ Pastries Strawberry. Per 1 pastry with icing: 180 Calories. 2.5g Sat fat, 13% DV. 180 mg Sodium, 7% DV.